During the process of choosing a complex rehab motorized wheelchair, your therapist works in conjunction with an ATP (Assistive Technology Professional) to determine which power wheelchair and components meet your needs. When selecting an electric wheelchair base, one of the most important factors to consider is drive wheel configuration. Front-wheel, mid-wheel and rear-wheel drive each have their own advantages. A wheelchair user should consider his or her medical needs, as well as how their motorized wheelchair will be used when selecting a base and drive wheel configuration. With a mid-wheel configuration, the drive wheels on a power base are literally in the middle of the power wheelchair. The user’s center of gravity is almost even with the center of the drive wheels. This design creates the tightest turning radius. Mid-wheel drive motorized wheelchairs can do a complete 360-degree turn. This maneuverability is extremely beneficial when using an electric wheelchair in the home. Navigating doorways and narrow spaces is much easier with a mid-wheel drive wheelchair. In terms of stability, mid-wheel drive electric wheelchairs are the most stable. These electric wheelchairs have six wheels on the ground, including two drive wheels and four caster wheels. This configuration provides greater stability to the base. A mid-wheel drive power wheelchair has caster wheels on the front and back of the base, helping to prevent the electric wheelchair from tipping forward or backward. Motorized wheelchairs with mid-wheel drive also have good traction on most surfaces, inclines and side slopes. Plus, mid-wheel drive electric wheelchairs climb obstacles well, such as curbs and small bumps. Mid-wheel drive motorized wheelchairs are the most intuitive, offering a shorter learning curve, particularly for new power wheelchair users. 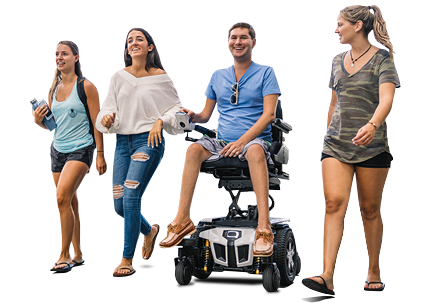 Mid-wheel drive electric wheelchairs offer many advantages and are a great choice for users who need more stability or will mostly use the power wheelchair in the home. If your ATP and therapist believe that a mid-wheel drive electric wheelchair is a good fit for you, consider the Edge 3 power wheelchair. The Edge 3 motorized wheelchair features mid-wheel drive and is easily adaptable to accommodate a user’s seating and positioning needs. The Edge 3 is available with iLevel® power adjustable seat height, allowing users to drive at 4.5 mph while elevated so they can safely cross streets and parking lots. iLevel raises power wheelchair users up to 12 inches, enabling them to complete Mobility Related Activities of Daily Living (MRADLs), such as reaching, cooking, grooming, toileting and transferring. Upgraded SRS (Smooth Ride Suspension) enhances the stability of the electric wheelchair by providing a smoother, more comfortable ride.